The Mac version is 32 bits only, it's not compatible with Logic X and might show some incompatibility with OSX from 10.9 and newer. This plugin is not compatible with Pro Tools and is not guaranteed to work with 3rd party plugin format adapters. Please test the free demo version! Tape echo effects were invented towards the end of the fifties. Presumably the very first tape echo machine was invented by Charlie Watkins of London, England, in 1958. It was based on a small loop of 1/4" tape onto which audio was recorded by a magnetic head and then read by three separated heads. What was read from the tape was amplified by the internal all-valve circuit and eventually recorded back to the tape, creating the feedback or "sustaining" echo effect. The delay time of the unit was determined by distance of the write head from the read heads, in conjunction with the speed of the tape. Many manufacturers of this era produced their versions of echo machines, mostly based on the magnetic tape system. The famous Binson Echorec was based on a circular drum head with a metallic magnetic stripe. It was used by Pink Floyd at the time of their album "Echoes". Another famous tape echo machine was the Maestro Echoplex, heavily used by pianist Herbie Hancock. 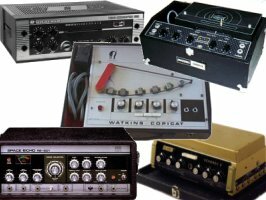 Other notable units were the Selmer TruVoice Echo, the Dynacord Echocord, along one of the most famous and widely used from 1973 to present day: the Roland RE-201. This particular model has a tape loop about 4 meters long which is recorded, read and erased continuously. It consists of one erase head, one write head and three pick-up heads, which when combined with the variable speed DC capstan motor allows many different delay configurations. This machine also offers a reverberation effect based on a spring reverb tank. The combination of echo and reverb gives an "ethereal" ambience effect which eventually inspired the engineers so to name it "Space Echo". 1) the unpredictability. A capstan motor is never perfect like a digital clock signal, resulting in slight variations of the delay times and pitched sound. 2) the frequency response and dynamic range. A magnetic tape is not as clean and flat as a digital recording. Especially a loop of tape which is cyclically erased and re-recorded many times in a short time lapse. 3) noise, hum, distortion. Defects that a digital system shouldn't have, sometimes are wanted and can become "musically acceptable". There is one way only to obtain all of this. To get the real thing. Actually there's a much affordable and easy alternative: to use an accurate digital simulation. Input Left, Input Right: GS-201 is a monoaural effect but it works for either mono or stereo buses or insert slots. With these two knobs you can set the input volume of the two stereo channels separately. Direct Level, on/off: The input audio signal is copied to the output unchanged. With this knob you can set its level. Use the little on/off switch to turn on or off the dry signal. More generally, you should turn off the dry signal when using GS-201 on an effect bus (send/return), and leave it on when you're using GS-201 as an insert effect. Mode Selector: This 12 way rotary selector lets you choose among various combinations of echoes and reverb. 4. Two taps: Second + Third head. Mode #12 is "Reverb only" which excludes the echo effect. Repeat Rate: This knob lets you vary the speed of the capstan motor which leads the tape, consequently changing the overall delay time. Turn it counterclockwise for longer delay times and clockwise for shorter delay times. When moving this knob, a pop-up window will show the actual delay times in milliseconds for all three heads. Please refer to the section Frequently Asked Questions for useful tips about this control. Intensity: With this knob you can choose the quantity of signal to be reproduced and recorded back on the tape, thus affecting the delay feedback level. At high feedback levels the tape echo could engage an infinite feedback with drastic signal degradation. Bass, Treble: With these two knobs you can adjust the frequency response of the sound output from the tape. Echo Volume, Reverb Volume: With these two knobs you can adjust the volume of the two effects separately. Power: This switch turns off or on the effect unit. RT, 456, 468: This 3-way selector lets you choose between three different kinds of tape used by the echo machine. RT: this is the original tape model. 456: this is the famous "Grand Master" tape model, mostly used for multitrack recorders and not so suitable for these machines. It has a brighter response, a higher gain and less distortion than the original tape. 468: this is the famous "Low Print" tape model, mostly used for hi-fi tape decks. Its characteristics are half-way between the RT and the 456 tape models. You won't notice huge differences between the three tape models in a normal situation. The difference becomes more noticeable with longer feedback levels, especially when the tape goes into the self-oscillation state. In version 1.1, when you move a control on the User Interface, a small display appears on the screen showing the current value of the active control. When you move the "Mode Selector" knob, another display shows the tape heads and reverb arrangement based on the active knob position. Passing your mouse pointer over the controls, a pop-up text describes their function. - hold down the ALT key to activate the circular control of the knobs. How, a digital delay effect with no tempo synchronization? This has been long discussed before the release of this effect. No, no sync. Sorry. Due to the mechanical nature of the original tape echo, talking about "tempo synchronization" would have gone against a purist and accurate simulation. The delay time is prone to slight changes in time, because the capstan motor somehow "flutters" and is never precise like for a digital delay. Under a certain point of view this should be considered a feature rather than a lack. How can I find the right delay time based on the tempo of the song? There are many ways of finding the right delay time. First of all, imagine to be in 1973 where even the most advanced drum machine then available didn't have a clear tempo display other than a simple knob labeled "tempo". In that case, the right delay time had to be found by ear, that is the easiest way. As you may have noticed, the three heads are almost equidistant. That said, according to the magnetic head you're playing, with the "Repeat Rate" knob set at middle you should have a delay time of about 113 ms for Head 1, 220 ms for Head 2 and 331 ms for Head 3. From these values you can move back and forth to find the right delay time you need. 240 / 124 / 4 = 483 ms, which is equivalent to Head 3 (mode 3 or 7) with repeat rate at minimum. 240 / 115 / 5.333 = 391 ms, which is equivalent to Head 3 (mode 3 or 7) with repeat rate two notches below the middle... more or less. Another important consideration must be done about the narrow limits of this echo machine. As you can see, not all time synchronizations become possible, for example you can't have a quarter note at 120 bpm which is exactly half second (500 ms) because the maximum delay time possible is about 487 ms. I hear a background noise, is there something wrong with my configuration? Nothing wrong. Have you ever heard a tape machine completely noise-free? The background noise is part of the simulation, and covers a very important role because it is always mixed with the incoming audio signal, and has a big influence on the dynamic range of the tape sound, especialy when infinite feedback is engaged. - Is there an option in GS-201 for getting rid of the tape hiss? - Can GS-201 synchronize to host tempo?